Happy Bloggers Challenge Friday! With this weekend being the 4th of July here in the US, I issued a Patriotic Theme Challenge to the players. I combined my Bloggers Challenge with Mercy's Tuesday Sketch MTSC80. I used Adirondack Paints in Red/Blue with the Bingo Blast Technique for the background. The wonderful image is from the Artistic Outpost Hero plate. The image is stamped in Black Archival on Watercolor, I used Distress Inks and the Watercolor Distress Technique to add color to the image, then cut with Spellbinder Dies. I added a wonderful vintage button from Tim's Accoutrement Line along with some Red Seam Binding to finish off my card. Looking for more inspiration, click on the Bloggers Challenge Logo on my sidebar to see what the other players created this week. Have a Safe and Happy 4th of July weekend! love the little guy saluting. He is precious. Great card with our nations colors. Outstanding! Luv the blast and the layout. Happy 4th! Awesome card. The background is so striking and I'm in love with that AO image. The ribbon and button are perfect embellishments. Your bingo blast turned out like fireworks! Wonderfully done!!! Happy 4th!! 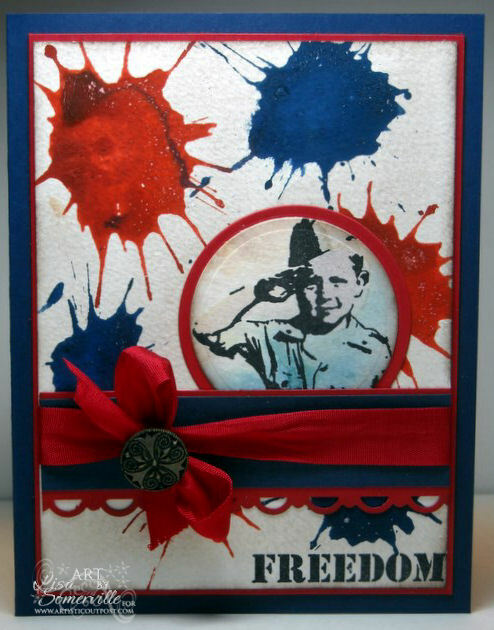 Perfect patriotic theme and card! Love the card. Happy 4th! I have not tried this technique!!! Love the image and your card. Fabulous background! Oh, I LOVE Bingo Blast! Perfect background for the holiday and your card! Love it! This is fabulous! Beautifully created. Lovely tribute. Hooray for the Red, White and Blue...your card is awesome. Really captures the spirit of the Fourth of July. That background really pops! Very cool card! I love that image, so antiquey looking! Really love this image with the color theme...wonderful! WOW!!!! Love that little boy and that background is awesome!! Have a great holiday!! I love bingo blast techie...it is clear defining and full of life...great image you used with the background. Love that little boy image! What a great way to show him off with that fun background. Great image for the 4th and love the background splats! The colors are fab. Very striking background and great layout design! Your focal image is wonderful...great card! The background is fabulous! Works perfectly with the image and colors. Love that background! Lots of color, great card.